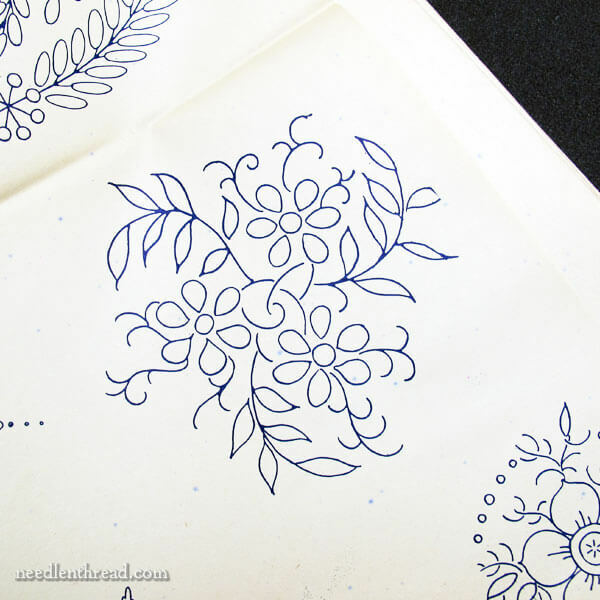 I love old hand embroidery patterns! Love ’em, love ’em, love ’em! Ever since I got ahold of my first old embroidery pattern portfolio some eons ago, I’ve collected them like a fiend. And apparently Pat, one of our stitching cohorts who follows along here on Needle ‘n Thread, knows this, because she recently sent me a surprise package. And who doesn’t like surprises? And who doesn’t like packages? So, combine surprise, package, and old embroidery patterns, and hey! I’m in heaven! So here’s the pattern portfolio – it’s quite a doozy and there are some really good ones in here that would be fun to interpret into all kinds of different embroidery techniques. At the end of the article, I’ll share one of the patterns with you as a PDF, so that you can download it and play with it, too! 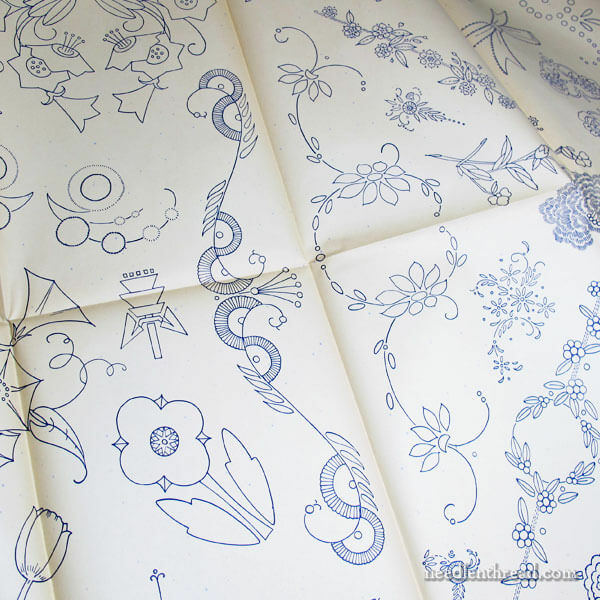 This portfolio of patterns – they are big, 24″ x 36″ folded pages of iron-on transfer patterns – is called The Wonder Package. The name cracks me up! As you can see, the portfolio contains over 475 decorative initials and over 350 patterns, no two alike! The Wonder Package was published by The Detroit News at some point since the advent of iron-on patterns. There’s no date on the box or the individual pages. The pages are in great shape for their age. While they’ve yellowed significantly and they do have some very subtle mildew spotting on them, they’re completely intact with the exception of some edge wear and a few small edge tears, and it’s obvious that they’ve never been used. The designs in The Wonder Package range from delicate designs suitable for small projects (think: wedding hankies, baby clothes) to bold patterns suitable for big projects, like table cloths or quilts, curtains, or bed linens. And the subject matter ranges from florals to geometrics to juvenile to animals to alphabets to… you name it! Come on! Who wouldn’t fall in love with a face like that?! There are patterns that are obviously meant for cutwork, and there are several stamped cross stitch patterns as well. Many of the larger, simpler patterns are ideal for appliqué or quilting patterns. and some are even a bit on the quirky-funky side of things! I thought this little knotted floral bunch was kind of neat, so I’ve re-drawn it, and it’s available below in a handy-dandy PDF printable. I could see this worked in practically any embroidery technique! From colorful and fun surface embroidery stitches, to stumpwork, goldwork or a combination, to whitework, even Brazilian dimensional embroidery – whatever you’re game for! The design prints at 5″ wide and a little shorter than 5″ tall. I’ll be scanning most of this portfolio, so that I have an electronic copy of the designs. That way, if there’s any further deterioration in the paper, I still have the designs. Plus, it’s just easier to work with the patterns if I have them saved digitally. Once the designs are in an electronic format, I can work with them to make them available for you, too. I probably won’t reproduce every design (there aren’t enough hours in the day! ), but I’ll filter some of them out to you now and then, so that you can have a bit of stitching fun with them, too. I began collecting old patterns when I was in college, usually finding similar portfolios or ladies’ magazines at library sales, used book stores, and places like that. When I was dabbling with them then (just over 20 years ago), I picked up quite a few collections for a practical pittance. For a while, I went through an eBay phase, where I bought pattern collections there as well. The resurgence of interest in vintage embroidery designs, though, has drastically increased the cost of them on eBay. Now, I pretty much just leave the collecting to happenstance, rather than actively seeking old patterns, unless something comes up that I can’t resist or that is of particular value or interest. What do I do with the ones I have? When I can, I scan them. And when time allows and it’s appropriate, I share them with you. That way, the patterns go on living, and they are used for what they were originally intended. Was I thrilled to get this fun and diverse collection? Yessiree, Bob! Thanks, Pat, for thinking of me! The patterns have a good home. They’ll be taken care of and put to good use! Do you have any questions about old pattern collections? Do you like collecting patterns? Do you wonder what to do with patterns like these? Any questions at all – we’re all ears! Feel free to start up a conversation in the comments below! I would love to hear about what everyone is doing with old embroidery patterns. I have found several from my mother and grandmother, how old, well I am 70, soooooo. Anxious to hear any suggestions. I really don’t want to keep them, would hate to throw them away and really can’t bring myself to do that! Mary Kay, perhaps our Mary would like to have them if you don’t want to keep them. She could be The Great Repository of All Things Embroidery Related. She clearly has great respect for these materials; you would be assured that they would put to their best use. I would be most happy to send patterns to Mary, but would want to know if she wants them. I could imagine she could get overwhelmed by mail if everyone started to mail them to her. Thank you Linda, if she wants them, I’ll send them. My comment disappeared! Forgive me if it duplicates. I started an embroidery group here in Canada and I am always on the lookout for patterns. We started with an antique coverlet, and are building a collection of patterns and images to work on. I would love and appreciate any images or patterns sent our way! We are trying to preserve these beautiful pieces of art for generations to come! I found an advertisement for The Wonder Package in the Battle Creek Enquirer (Michigan), dated April 16, 1933. 800 Hand Embroidery Patterns. The patterns look really fun. Personally I’m completely in love with the wonderful 19th-century Berlin work/ needlepoint/cross stitch booklets. Many are alphabets but there are also ones with patterns. I, too, started collecting these from flea markets and antique shops when they were nearly sold as bulk paper. Some were reproduced by DMC et al, but many more exist and fun to find. You’re so goo to us! There is nothing like an instructor is is passionate beyond measure for her art. I’m looking forward to receiving other embroidery patterns. The Floral Knot is so dainty, so light, so lilting! I love it, and it will be my next project. What a treasure trove (which is what I would name the new batch of patterns) of vintage patterns! Does anyone out there dearly love the “vintage ladies of the 20’s and 30’s? They speak so vividly of who were as women and who we are today – lovely, fiesty, inquisitive, smart and sassy! I love old patterns too, and scour the second hand shops wherever I go and head straight for their craft section! especially in country towns I have got a few gems. Also old doilies to do. Have just acquired another 2 vintage ones. They are great for a variety of stitches, and colours to jazz them up a bit for the next generation! Wow! These are fantastic -and so diverse, too! From sweet to ultra modern. I love them! Will be keeping my eyes open for some, myself – such fun!! I enjoys this article, anything from the past is a treasure. I think the pattern you are offering to us would look great in the corner af a hanky. But I’m not good at hiding thread ends. Could you give me some tips. Love your newsletter. How do you care for the pattern Wonderbook? You memtioned mildew- is there a treatment you do or a way to store it with — that will keep it in better condition? No, there’s no treatment for the slight mildew, Heather – at least, not one that I know of, that would be affordable for me. I store my old patterns in acid neutral boxes, away from light. Thank for for the lovely pattern. I love the old patterns and recently went looking for a pattern for pillowcases and came across your website. Looking forward to receiving your posts! Just love these old patterns. 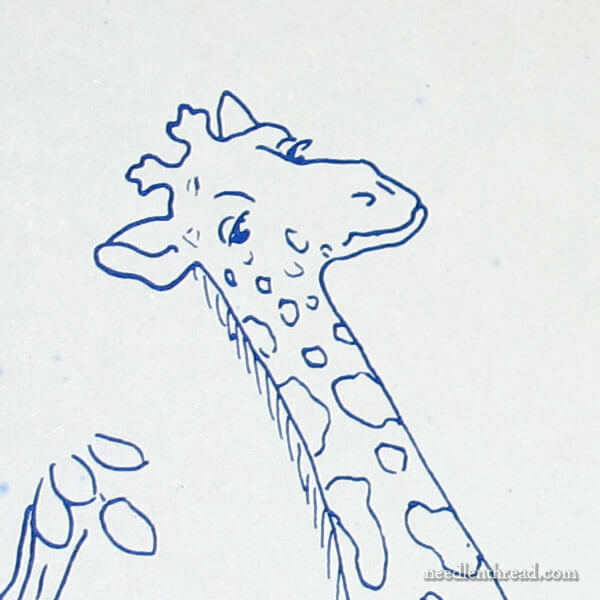 Any chance you could let us have the giraffe pattern as you said — he is irresistible. Oh, please, please could you scan and make the giraffe available? I have fallen in love with him. I love patterns too. I have been collecting since I was about 10 years old and am now nearly 65 years old. All sorts of patterns from knitting, sewing, embroidery and all sorts of handwork. I have literally thousands. I just love looking through yours and mine, when I have time, of course. 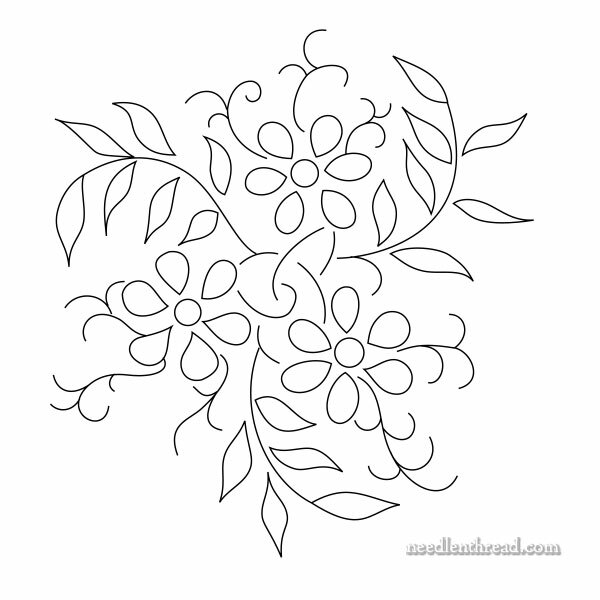 I could also see these patterns can be used for silk ribbon embroidery. What a treasure! Thanks so much for the floral pattern and sharing your love of these patterns. I love the quirky bird!! The only patterns I collect are the ones I find in my stash room that I purchased and never completed! Seriously, I do collect thimbles and other sewing accessories to go with my Great-Grandmother’s Singer Treadle machine…. Love that giraffe and so would my grand daughter!! So pleased to see this collection in good hands and being shared. I love this. Thank you so much for sharing. Are you going to re-print these so we can buy them? This is my favorite was to do embroidery. My grandmother embroidered a of baby blankets and quilt squares. 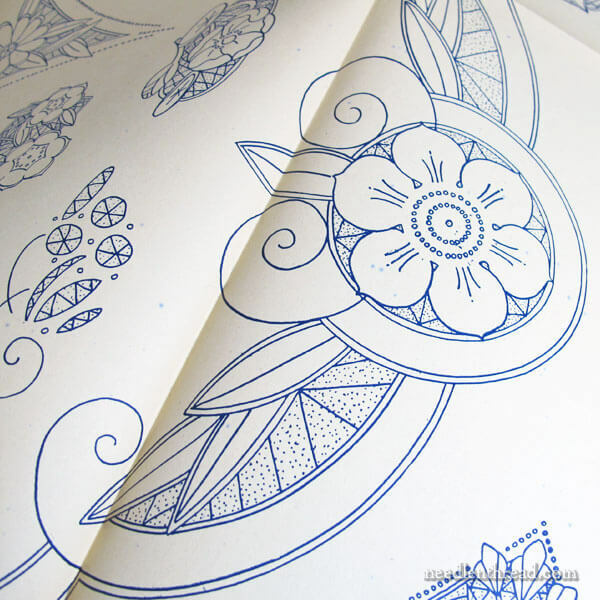 She often used pages out of children’s coloring books as her patterns. So sorry – I thought I proof read and I guess I didn’t. I meant say, may favorite “way” to do embroidery. And that my Grandmother embroidered a “lot” of baby blankets. Thanks so much for the darling motif. Always looking for something I can use on my crazy quilting. Right now I am working on some hexagon blocks. Think I will shrink this little guy to fit a center of one of the blocks. Then will use Perle cotton and silk ribbon for the stitching. My grandma used to use the long ones to embroider along the front edge of the pillow cases from a sheet set. I still have several of them. That would have been the 1940s to 1950s. I love the old designs. Thanks for sharing. That was a beautiful gift. Over 40 years ago, I borrowed some reference books on embroidery from our local library. I asked if it was okay to copy the photos and directions on the book since I couldn’t afford to buy the books themselves. The librarian said okay as long as it was for my own personal use and not to distribute. So I spent almost every afternoon at the library photocopying the pages, not all of them, since each book as was about 250-300 pages. Five years ago, I scanned them onto a pdf file and saved the files. Now that I am ‘retired’ I hope to do some of them to incorporate into the quilt blocks that I have on hand. I would post the titles of the books once I find the file where I have saved them for reference. Thank you for sharing this pattern with us. I save a copy already and I will make it soon. My question is: Where to find old Crewel Embroidery Patterns? to try it. Now that I have done so, I just want to find patterns so I can continue enjoying crewel embroidery. Well, you can find some online. It wouldn’t hurt to peruse Antique Pattern Library and see what you can find. You might search for both “crewel” and “Jacobean” on there. In this article: https://www.needlenthread.com/2012/04/free-jacobean-designs.html I linked to the Fitzwilliam book on Project Gutenberg. It’s a good source for Jacobean design styles that are commonly found in crewel. Some of the Therese Dillmont books on Antique Pattern Library have patterns in them, and while they might not be crewel patterns per se, they can certainly be adapted to crewel work. This design, for example, is redrawn from an old Dillmont book: https://www.needlenthread.com/2011/02/free-hand-embroidery-pattern-tulips-carnations.html While it wasn’t necessarily intended for crewel, you can see how it would lend itself to crewel work pretty well! Hope that helps! hoping to find so I signed up. Mary, what fun! I do love old embroidery patterns, although I haven’t gone out of my way to collect them or anything. This looks like a real find! What a fabulous find! I’m going to keep my eyes out for this one in the thrift stores. 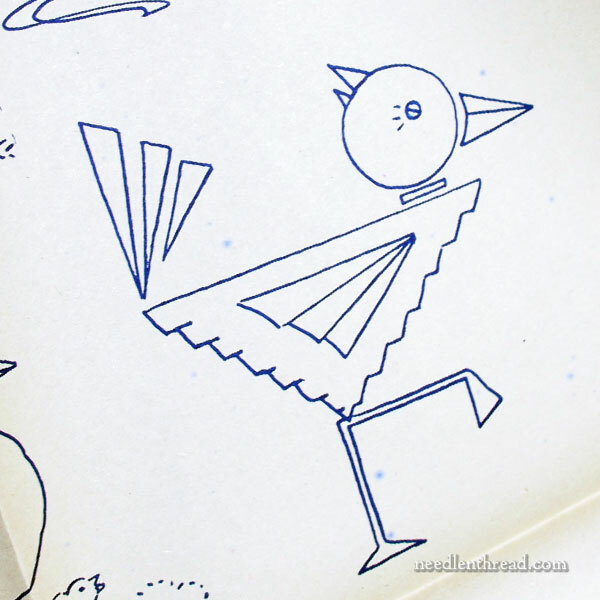 I love the quirky bird and the ones that are art deco. I have a nice little collection myself. Some favorites come from old magazines. I picked a couple up from England the last time I was there. They are from the late 30s and I love the photos and adds as well as the embroidery. I don’t always get a chance to stitch them up be cause I’m always working on more current pieces but I love looking at them. Thanks for sharing! I LOVE hand embroidery and everything that goes with it! My impetus is a tablecloth and napkins my mother embroidered during WWII waiting for her husband to return. Natural linen with a simple floral design. Yes, I use them because I love them. I purchased flour sack towels with the intention of an embroidery design in the corner . . . nostalgia. Growing up we had stacks of them . . . now I have one that my sister gave to me. I love needle n thread . . . Thank you Mary!! When I was a girl at home, I worked here and there to earn personal money, and much of that was spent on what is now called “vintage” patterns. With the old sewing patterns, I did an awful lot of sewing for friends at college. I bought crochet patterns, knitting and embroidery patterns too. For a frame of reference: I graduated from college in the early 1960’s. Books with multiple patterns sometimes sold for ten cents each. Rarely did I ever pay more than thirty-five cents for one. After my husband and I married, we moved from state to state quite often, but I always tried desperately to save and store my patterns for future use. Now, of the ones I have left, most have “bled” on each other. I suppose another way of saying that is that they have “stamped” themselves together. I know those can still be salvaged by drawing by hand, but not ironed on cloth like they were meant to be. How do some of you still use them? Wow! I have a handful of Aunt Martha’s Hot Iron Transfers that have lain quietly in my studio for years. I used to think my grand daughter might be interested in stitching them one day . . . Thank you for the information on these old packages of designs! I have a ton of magazines that include these but I especially like this one. There is another site using these as the center of their hexagon English Paper piecing. Your’s is already saved and printed. Thanks for all of your work in keeping your blog full of fun information and inspiration. What a lovely present and a wonderful surprise for you especially as you love antique patterns you must have been in heaven receiving them. I do like the giraff it so inviting. I don’t collect antique patterns but I do like them and the embroidery possibilities are endless but I just don’t have the room to collect large amounts of hardcopy patterns which is a shame. I do hope you enjoy every moment of your wonderful gift and thanks for sharing with us your surprise present from the lovely Pat. I don’t believe it. I recognize one of the patterns!! 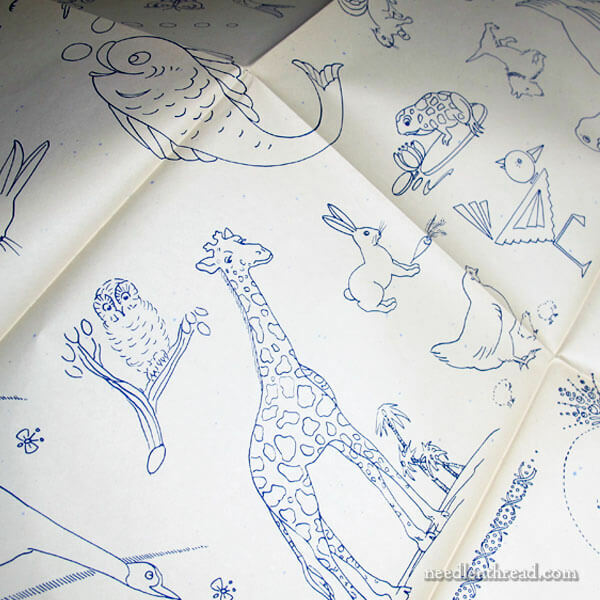 I have a vintage whitework cloth edged with the design in the picture following the giraffe! I love vintage designs and hope you get them all posted someday. Thank you for the pdf pattern Floral Knot. I see beads being added to this pattern. I love what you do and look forward to your emails. Continue doing what is easiest for you because it is working…. Thank you Mary. I have been stitching one of Trish Burr’s kits, “Little Cup of Flowers Lesson”. It is a White Work with Color design. I love it! I think your little floral design would look great done as a White Work with Color technique. I will give that a try. I, too, love that giraffe. What a treasure! Mary I know how busy you are, and you have given us so much…but that quirky little bird has grabbed my heart. I hope it becomes one you share with us. Hello – I really enjoyed your post today because it is one of my favorite subjects – collecting patterns. I too have been collecting patterns for a long time and though I love any old pattern, patterns from the 20’s and 30’s are my favorite. Some of my favorites are the crinoline ladies and just about anything adorned with ric rac….. This just makes my day. I have a strong and very fond memory of walking to the nearest dime store to pick out my embroidery patterns and thread. F0r some reason I think of this fairly often and your post just brought it all to life. Thank you, Mary. You truly do brighten my days! Yup, I collect them too! At least I did for quite a while long ago. As you said, they are more pricey now that they are back in vogue. My biggest treasure is a pile of circa 1910 French embroidery newspapers. Ohhh! I do wish that I was more adept at all-things computer (programs) to “clean them up” as you do. Thank you for doing that for us. It is interesting how period designs are “so” period! And it is hard to duplicate that authentic look with modern day renderings. Years ago I used these type of embroidery patterns for the bread/tortilla basket covers. My daughters used them as they were learning to embroider, as well as wonderful designs for kitchen toweling. I did collect different patterns, not only for embroidery while I lived overseas. It is a collection I treasure. 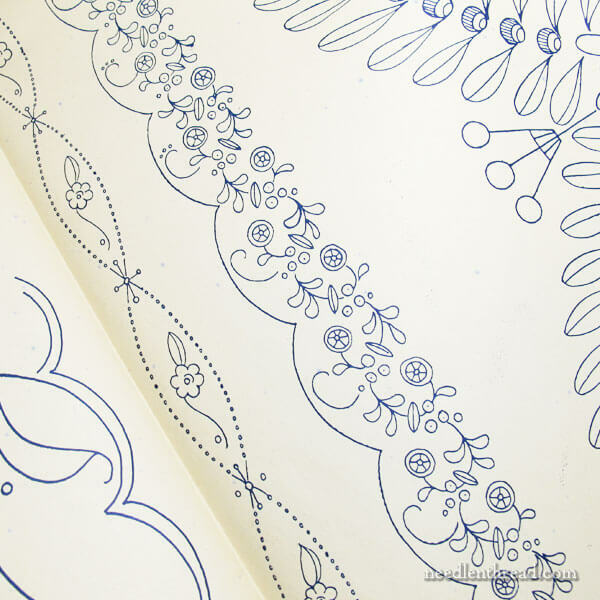 I hope you share more “scrolly” patterns from this gifted book! What a treasure! What a wonderful package indeed! I really wish Iron On Transfers were more popular today. I love the vintage patterns, but have had little luck finding any over the years, aside from a few of the newer Aunt Martha’s packs. To anyone who is lucky enough to have these beautiful designs, please consider scanning them and sharing them online! There is a great group on Flickr called Hoop Love (https://www.flickr.com/groups/hooplove/), which has hundreds of free scans of Vintage Transfers. I actually love stitching from scans of vintage transfers – my first ever embroidery project was a vintage Alice Brooks Bluebirds of Happiness design that I found online! Scans don’t have the convenience of being iron-on, but you can adapt the designs to your own projects a lot easier by leaving elements out or redrawing them when you trace them on your fabric, and you can draw a thinner line than the original bold blue ones. HI Mary can we purchase this wonder package or will you be putting it on your website. would really like to buy it or at least be able to print out the designs and use them. Mary, I collect old embroidery patterns as well. I usually skip the ones for kiddos, although I do love that giraffe’s sleepy expression. I love repeating patterns. For my latest one, I took the “Schoolhouse Tunic” pattern and put a repeating leaf pattern down the sleeves. To do this, I scanned the pattern, resized it so that it fit my sleeve length. Then I printed it, used a transfer pen from Sublime Stitching and ironed it on each sleeve. My fabric was a light cotton batiste from Melissas Fabrications on Etsy, so I didn’t want the embroidery to be too heavy. I ordered a lovely spring green Perle cotton in size 16 from Colonial Needle. They’ve got so many colors! I ended up using a simple back stitch to outline the leaves. Perle cotton washes so well and I’ve not had any problems with bleeding. I figured a cotton summer blouse would go through the washer a lot, and I didn’t want to fiddle around with hand washing. Even a simple embroidery on a blouse, takes it to the next level of custom clothing. 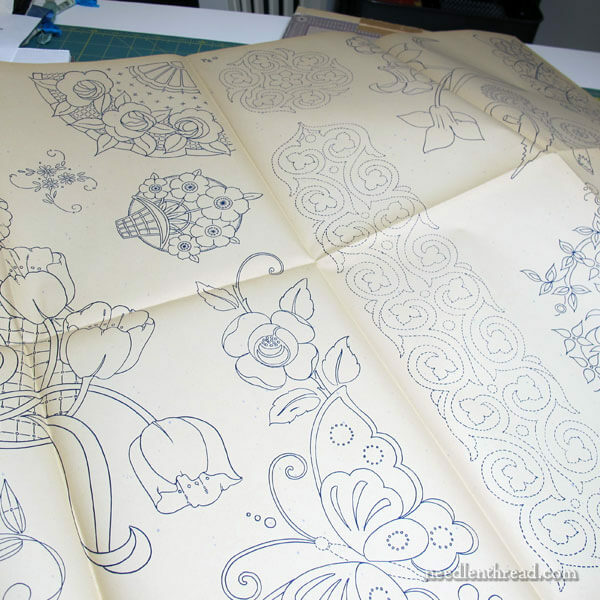 I found my embroidery pattern on Antique Pattern Library (oh no, the rabbit hole), W.F. Sherwood Co. This was a nifty collection, the patterns are a little fuzzy, but once you trace over them with a pen, they come out beautifully. This process was really so easy to do, I can’t wait to do another….well except for the fact that I’ve a crewel project wanting to be finished. So when are you going to show us the firescreen? I’m chewing my nails! Thank you so much for all the information. I already looked at the links and “Wow” these are just amazing patterns. Thank you so much for the Floral Knot Pattern. What a beautiful collection of Old Fashion collection Patterns you’ve got. What is the best way to save a persons embroidery patterns? I’ve tried to put them, in plastic folders, but that does not seem to work so well. I love these too and have a nice collection of items. Many are in the original envelopes they came and were sent away for by both of my grandmothers, so sweet to own! I have a question for you! How can I make my own transfers without hand drawing them? I have spent countless hours researching and coming up with nothing. I have hunted online, I have phone printing companies and no one seems to know what kind of ink is used in a home printer to make my own. I have lots of pretty designs I have drawn and would love to market them but have no way to print them! Do have any information? I have a few inherited ones and they conjure up another world. Such a delight! Thank you Mary for sharing the vintage embroidery patterns and thank you Pat for sending them to Mary! There are so many pretty vines and flowers! I’ve been finding and loving vintage embroidery designs on Pinterest, but am often at a total loss how to interpret them in embroidery stitches. I can do the obvious things – satin stitch, buttonhole wheels, detached chains, french knots, etc – and have added fishbone stitch and others from your Stitch Fun series for leaves. And fortunately I LOVE stem stitching, so that works for most stems 🙂 But even now I have a stitch dictionary, figuring out other stitches for flowers is challenging. Pinterest and google seem to show either the handful of stitches listed here, or lots of needle-painting. There’s not much in between! If anyone has a good reference site that actually uses stitches to embroider designs (as opposed to just illustrating how to make the stitch – important but not aesthetically appealing! ), I’d love to hear about it. Thank You. this brought back memories from when I was newly married, I also collected different craft ideas. I still have a few favorites. Thank you for the lovely pattern. I love old pattern and the giraffe is too cute, reminds me of April the pregnant giraffe all the world is watching right now. 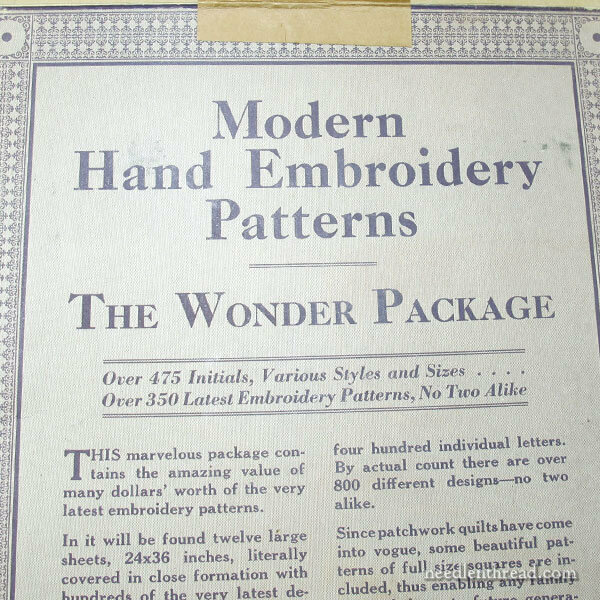 I found a few old (1936) booklets filled with patterns for huck embroidery, and have used them a couple times when decorating pincushions. It’s really neat to see a big folio like The Wonder Package. I’ll have to keep an eye open for such things at vintage shops from now on. Mary, you are really terrific to share your patterns and ideas with us! It’s wonderful that so many people treasure these old iron-on patterns. I have a small heap that had been my mother’s and grandmother’s, so dating from invention to the early 1950s, plus a few more recent that I’ve picked up here and there. The older ones are becoming brittle with age but they are just too beautiful to throw out. Wow! What a blessing! And thanks for sharing with us, Mary. I look forward to seeing scanned copies of these. I am embarrassed to ask this question because all your samples are so beautiful! I see what you’ve done and want to learn the stitches but then I see the pattern and don’t know how you decide which stitches to fill it with. How does one determine that? I keep waiting for the idea lightbulb to go off, but so far no luck; consequently, I’ve done no stitching at all. Do you have any ideas for people like me (please Lord, don’t let me be the only idea-less person out here!). Thank you! I so love reading your articles and seeing your beautiful stitching! Hi, Barb – Thanks for your question! There’s nothing embarrassing about it, trust me. All stitchers face the question of what to put where, to some degree or another, despite experience or lack thereof. For beginners, I think it’s mostly a matter of starting and trying different stitches in different areas of a design that you like (if you’re not following a kit). Once you’ve practiced a little, through trial and error and happy discovery, you’ll get a better notion of what stitch to use, where. As a general guideline, though, consider different types of stitch categories: line stitches work great for outlining. Do you want texture in your line, or a smooth line? Pick a stitch that produces a line that’s textured or smooth and try it. For areas that you want filled in, look at filling stitches and try different ones. There’s nothing at all to be afraid of – it’s just a matter of practicing and discovering what you like, what works to impart the look you want, and what is enjoyable. All that said, later this year, I’ll be taking some projects from start to finish, including the thought process behind my stitch choices. I’ve done this a few times on the site already – you can find several projects developed from start to finish under “Tips & Techniques” in the main menu on the website. Reading through these may help you develop some ideas. I think if you just plunge in and start, picking a stitch and seeing how it works and how it looks, you’ll find it’s easy to go from there. Maybe start with something like stem stitch – it’s pretty, it’s versatile, and it’s an easy stitch. Mary, thank you for your wonderful advice! I think I’ll start building some stitch “dictionary” fabric books for myself by stitching on smallish pieces of fabric, maybe 3″ or 4″ by 5″ or 6″ (one stitch per page so I can flip through the completed books and find the one stitch I’m looking for). Since I don’t know what I’m doing, my thought is to have a book for each of the types you suggested (Line stitches, Textural stitches, Filling stitches, etc.). At least that way I’ll actually START stitching rather than staring at a pattern and doing nothing because I don’t know what stitch I should use. Prior to your suggestion, I couldn’t even decide on how to organize the stitches I’m learning! Your way makes sooooo much sense! Much better than strictly by their alphabetical name! Thank you so much for sharing your knowledge with us and for all your encouragement! Does anyone use their vintage patterns? What kind of luck has anyone had in stamping them? Any tips or tricks they use? I have some old ones and I would love to embroider them but I’m afraid that after all this time they won’t iron on good? Any sugustions would be appreciated! I like to do tea towels so 100% cotton fabric would be used. Sandy, the best way is to do a test on a scrap of fabric of the same type as you will be using. I’ve found that there is usually some small bit of wording on the pattern sheets that can be used for this. If the test ‘fails’, my suggestion would be to trace the pattern onto you fabric. I love antique/vintage patterns. I troll Pinterest looking for them…lol just love the sneak peek at the collection your u just inherited! How wonderful to have the opportunity to save such a gem! Thank you for the design you included today! I can’t wait to see the upcoming gifts from your u! Very excited! What a delightful post Mary, thank you. I have been collecting from kind folk and the local op. shops, partially completed embroideries. Mostly tablecloths, tray cloths etc. Some are from more recent times ie 1970s but many are from the fabulous 1950s and earlier. I adore floral scenes and crinoline ladies, if I am very lucky an unusual piece of kiwiana or something aimed an the young girl starting her stash. I love the freebie you are offering. Thanks for sharing, and a big thank you to Pat for sending the patterns to you so that they could be shared. The tantalizing glimpse of morning glories(?) on the left-hand side of the third image is causing my fingers to twitch. Would you consider sharing that one as soon as you’re done with the giraffe? Thanks again. Thank you! This is very special. I have a technical question: how do you redraw them? Have you written an article about it already? I would love to share the old patterns I own by I know not only about scanning them not redrawing them. Do you have any tips and techniques on this topic? Hi, Benhy – I use Illustrator, primarily. You can also use Inkscape, which is open source and free. Hope that helps! What a great collection of embroidery designs! I shall look forward to seeing what you do with these! Thanks for sharing. My late Mother had a lot of these. She past away @ 68yrs. Over 35 years ago. I kept a lot of her embroidery but not these unfortunately. She had a couple of pieces unfinished and I bring them out every Christmas and do a little bit of them, brings her back to me. I live in South Australia. Mary, thank you so much for sharing the beautiful embroidery pattern. I have saved it to my files so I can print it to use in the future. I appreciate you sharing it with all of us. What fun! very much interested and appreciative in of wonder book designs. can’t wait till a few of them are available digitally! thank you, again. I love these old patterns too. How do you handle the issue of copyrights? I make sure the designs are public domain, or that I acquire permission for reproducing them, if the company is still in business. Hi! I really wonder where to get vintage pattern. How can I be able to know that they are worth saving as in some there is no date mentioned? Please guide me through. Will vintage embroidery iron on patterns wash out of the piece when the stitching is done, or would it be better to trace these patterns onto the fabric to be stitched? I have several that are more than 40-50 years old that I would like to stitch. I would probably trace them, myself. Then you’d have the originals without having to cut them out. Folks might find a book of iron-on transfers from Dover interesting: It is Elegant Medieval Iron-On Transfer Patterns by Marty Noble. Of course the patterns can be traced as well as ironed on, according to preference. I found it for $6.95 from HamiltonBook.com, but it is also on Amazon for just a couple dollars more. There are a lot of gargoyles and monsters in it, which are not to my taste, but it also has some lovely stylized floral medallions, elements which can be lifted from larger pictures, as well as other small separate elements, a few larger designs that could be adapted to modern Jacobean-type work, many things that would take well to goldwork, border elements, and small images just right for practice stitches. Just a fun, different array, which I am very pleased with. And…if you have been searching for gargoyles, dragons and their ilk, you will be in design heaven! Great site!! I LOVE all things embroidery..so much so, id really like to have a go at designing my own for a personal gift. Hi, Ba – I highly recommend purchasing Sublime Stitching’s fine-tipped iron-on transfer pen. It works great! Creating iron-on transfers on printed paper requires special equipment and special ink. You can also have custom iron-on transfers made for you, through Stitcharama Crafts. I find that when I use embroidery transfers that eventually they stop working. I always use them on flour sack towels. If I leave the heat of the iron on the transfer longer, it usually turns the paper a little yellow and still doesn’t transfer well. Hi, Maureen – I find that placing the iron straight down, leaving for a few seconds (maybe a count to five?) and lifting straight off, then straight down on another section, leaving for a count to five and lifting straight off, etc. helps. If you use transfers frequently, you’ll get the hang of the settings for your iron and the time to leave the heat on the transfer. If you’re using the same transfer over and over again, they’re usually only made for about three decent transfers, if you’re lucky!